Benjamin Winzenburg knows that “God moves in very mysterious ways and that anything can happen at any moment,” even beginning the journey to becoming a Catholic in a grocery store check-out line. That’s how he began the process of entering the Church. A Minneapolis native who moved to Vermont in 1999, Winzenburg, now 29, had, at times, attended Southern Baptist, Methodist and evangelical churches but never felt complete. Not long after that prayer, he was working as a cashier at a Burlington grocery store when Father Jon Schnobrich, vocations director for the Diocese of Burlington and then director of the Catholic Center at the University of Vermont in Burlington, came through his line, wearing his clerical clothes. They struck up a conversation and set up a meeting. “I did a lot of listening and asking questions, and he shared his story and then began to ask some questions about the faith which led him to decide that he wanted to learn more,” Father Schnobrich said. He participated in the Rite of Christian Initiation of Adults and was received into the Church at the Easter Vigil in 2011 at St. Joseph Co-Cathedral in Burlington; Father Schnobrich was his sponsor. 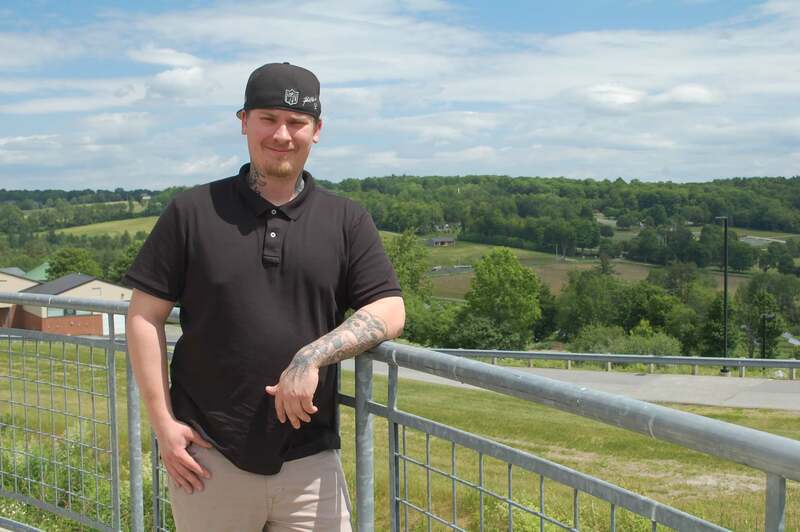 A car enthusiast, Winzenburg works as a Chevrolet dealership in Newport, New Hampshire, and lives on the campus of Vermont Technical Community College in Randolph Center, from which he earned an associate’s degree in applied science in automotive technology this year. He continues to live on the campus and planned to work toward a bachelor’s degree in business technology management. But at one time Winzenburg was “near homeless,” and enrolled in the Maple Street Residence, a transitional living house under the umbrella of Spectrum Youth and Family Services, of Spectrum Youth Services in Burlington. His mentor there was the Spectrum executive director, Mark Redmond, a parishioner of Holy Family St. Lawrence Parish in Essex Junction. “He inspired me to find a profession that pays more than what I got working at a grocery store” where he also worked as a maintenance technician, Winzenburg said. And when he graduated from the community college, it was Redmond and Father Schnobrich who attended in support of him. “It was a joyous feeling” to have them share in the celebration with him, he said, especially because no family members attended. That inspires the priest to want live his vocation with greater authenticity. “I’m doing everything I can to live the way God wants me to live:” in peace, in happiness and with mercy and forgiveness and helping people in need, Winzenburg said. He hopes some day to be a mentor just like Father Schnobrich and Redmond were mentors to him, helping someone learn life skills and embrace faith in God. “I’m very proud of Ben because as he continues his journey of faith, with its ups and downs, I know that deep down in his heart he knows his identity as a beloved son of God and a member of God’s family, the Church,” Father Schnobrich said.